Professor Fernando Rey (1963) received the degree in chemistry at the Universidad Autónoma de Madrid (1986). Their Ph.D. studies were performed at the Institute of Chemical Technology (ITQ) under supervision of Prof. Vicente Fornés obtaining his Ph.D Degree in 1992. The area of research of his Ph. D. Thesis was synthesis, characterization and catalytic applications of hydrotalcites. Subsequently, he joined the group of Prof. John M. Thomas from 1993 to 1995 at the Royal Institution of Great Britain as Post Doctoral fellow. During his Post doctoral stay, his research was focused on the development of new ‘in-situ’ characterization tools based on the employ of synchrotron radiation for the understanding behavior of micro- and mesoporous catalysts. He returned to the ITQ in 1995 and one year later he obtained a permanent position at that Institute. 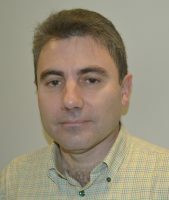 He was promoted to Research Professor of the Spanish National Research Council (CSIC) in 2007. His current area of research is focused in the synthesis and deep characterization of micro and mesoporous materials with application in catalysis and adsorption. He is co-author of more than 100 papers in high impact Scientific Journals and numerous presentations in congresses, and currently his ‘h-index’ is 37. Also, he is co-inventor in more than 40 patents related to the synthesis of new porous materials and their application in different industrial processes. Some of these patents have been licensed to industries. In 2011, he was recipient of the 1st Award of ‘La Vanguardia de la Ciencia’ that recognized the best Spanish research scientific publication in 2010.